A somatic embryogenesis protocol was developed for Eschscholzia californica Chan. (California poppy) using embryogenic cell suspensions and optimized media conditions. Rapidly-growing, finely-dispersed embryogenic cell suspension cultures were established from embryogenic callus and maintained in B5 liquid media supplemented with 0.5 mg 1−1 (2.26 μM) 2,4-dichlorophenoxyacetic acid. Culture conditions were optimized by investigating the effect of basal media composition, gyratory shaker speed, various carbon sources, different cytokinins, and AgNO3 on the efficiency of somatic embryogenesis. After 40 d in culture, the somatic embryos that formed were counted and their overall growth expressed as pecked cell volume. The selected media consisted of either Gamborg (B5) or Murashige and Skoog (MS) salts and vitamins supplemented with 40 g 1−1 (117 mM) sucrose, 0.05 mg 1−1 (0.22 μM) 6-benzylaminopurine, and 10 mg l−1 (58.8 μM) AgNO3. Somatic embryo production was substantially reduced at shaker speeds above 40 rpm. Glucose and snerose were the most effective carbon sources, whereas fructose, galactose, and maltose resulted in a reduced yield and growth of somatic embryos. The development of somatic embryos was promoted by AgNO3 at concentrations below 10 mg l−1 (58.8 μM). 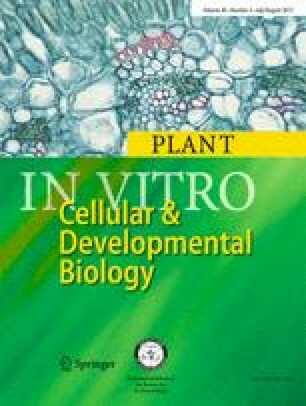 A semi-solid medium containing 1.5 g l−1 Gel-rite produced the highest frequency of somatic embryo conversion, and promoted the efficient growth of plantlets. Using the reported protocol, over 500 viable somatic embryos were produced per 25 ml of embryogenic cell suspension culture.